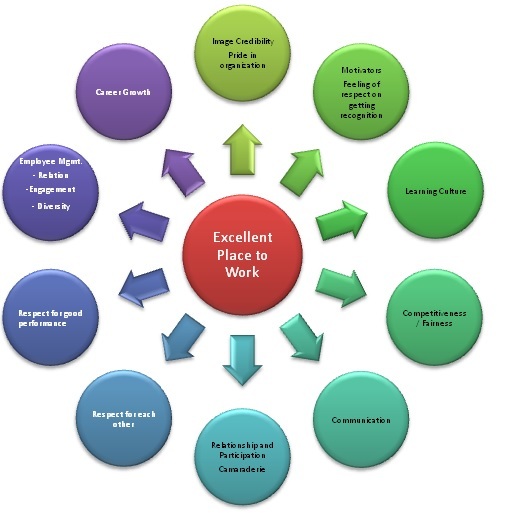 What makes an organization an ‘Excellent Place to Work’? An Excellent Place to Work is the one which has; ‘High-Relationship Environment’ (HRE), ‘High-Trust among Peers’ (HTP), ‘High-Performance’ (HP); and ‘Great Leadership’ (QL) Culture with ‘Fair Assets Distribution’ (ASD). Great Leadership, Consistent Employee Experience and Sustainable Financial Performance. What changes should be made to improve our workplaces and our overall levels of employee engagement? Besides the above, there are many answers and many views. Out of those ‘many answers and many views’ we tried to formulate a cohesive whole wherein we can find an answer to make our Unique and Excellent Place to Work. That means the concern for good communication topped the list. When communication fails, maybe because of incorrect or miscommunication, extra work is required to correct the situation. It may lead to either (i) employees must rework on the projects that were initially completed incorrectly or (ii) because multiple employees mistakenly work on the same tasks as a result of unclear instructions. The same reason was also found in our (Salahkaar’s) experience with most of Indian organizations where we have consulted. When employees want to fire their colleagues/bosses will generally mean that organization’s culture and the impact colleagues have on culture and workplace satisfaction takes a deep impact on organizational efficiency. Credibility: Credibility is the extent to which employees see management as credible (believable, trustworthy). By assessing management’s communication practices, competence, and integrity one can estimate the level(s) of management credibility. Respect: People feel respected when they are supported to produce their best work, when they are collaborated with and when they are cared for as individuals. Fairness: Fair distribution of resources, opportunities, authority, influence; absence of fairness breakers such as behind the back conversations; and presence of appeal systems as additional layers to guarantee of fairness play a role in creating fairness within an organization. Pride: People experience pride when they make a significant contribution towards their organization’s success which in turn contributes towards a better society. Camaraderie: People want to connect with others and belong. Intimacy, hospitality, and sense of community increases camaraderie within an organization. 3. Create healthy competition among employees. ………… REST OF THE MATTER IS TRUNCATED TO AVOID COPYING OF METHODS..
WHAT WILL BE OUR ROLES AND ROUTES? Figure-2: Depicts the broad routes of covering all of the agenda mentioned above. We propose to go a few steps beyond the (general) Certification requirements. We propose to cover the following in the survey. 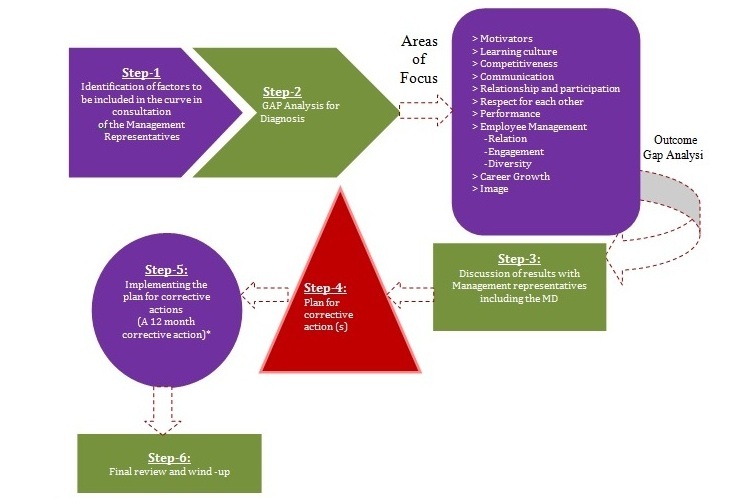 Steps-2: Survey to measure Company’s preparedness—Gap Analysis. The survey will cover about 40% of employees in general and 100% of the top management team, including COO, CEO and MD. In terms of the requirements of the various other certification agencies, Salahkaar Consultants will find out the missing points of the company’s and then we will guide to fill the gaps and move forward toward obtaining the Certification of any certifying agency of the world. REST OF THE MATTER IS TRUNCATED TO AVOID COPYING OF METHODS..
Month-12: If asked for we can take-up the responsibility of moving to the relevant agencies for the award. We are willing to take up this gigantic task to lead the company to the coveted goal from the month of October, 2017 itself. Will depend on your need. Company will also bear additional cost of travel and stay in a good quality hotel in or around Kolhapur. Company will also arrange for all local hospitality in a five star hotel and support facilities like Cyclostyling, Venue, Local transport, Audio -visual instruments (LCD), etc. All reading and exercise material and stationary costs will be paid by the company. It would be good in the interest of the effectiveness of the program if it is organized in a star hotel or conference hall of the organization. Consulting will be provided by a team of senior trainers and support staff (s) of the SALAHKAAR CONSULTANTS from the list seen here or other consultants seen on our panel.